"PYRAMID" is a Greek word consisted by two words 'PYRA' + 'MID' where the term PYRA means "FIRE" and MID means "Center Core". Hence it is said that an Object which contains "FIRE" (here the deeper meaning of Fire refers to the energy field) in its Center core or Nuclei. This shows that Egyptian people were fully aware of the deeper meaning of FIRE and were using it accordingly thousands of years ago. A pyramid is a structure whose outer surfaces are triangular and converge to a single point at the top, making the shape roughly a pyramid in the geometric sense. The base of a pyramid can be trilateral, quadrilateral, or any polygon shape, meaning that a pyramid has at least three outer triangular surfaces (at least four faces including the base). 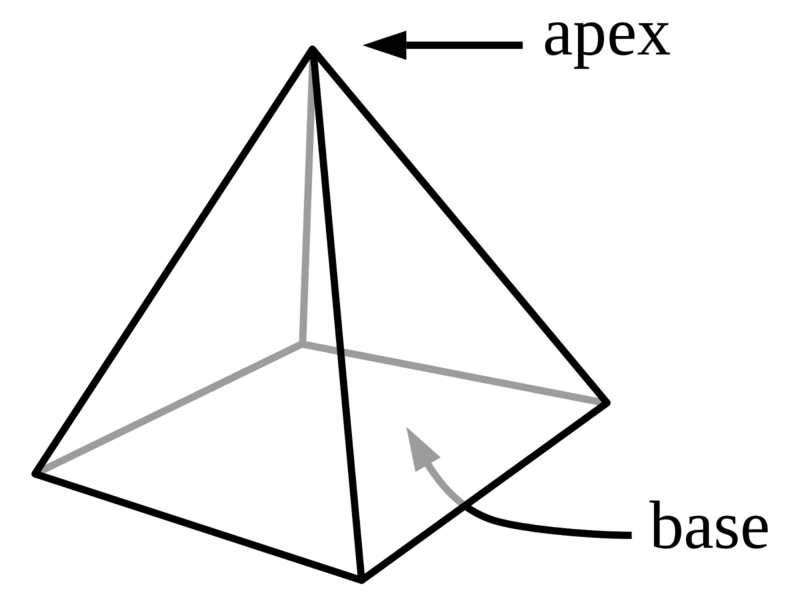 The square pyramid, with square base and four triangular outer surfaces, is a common version. A pyramid's design, with the majority of the weight closer to the ground, and with the pyramidion on top means that less material higher up on the pyramid will be pushing down from above. This distribution of weight allowed early civilizations to create stable monumental structures. • Food kept under a pyramid will stay fresh for two to three times longer than uncovered food. Artificial flavourings in food will lose their taste, but natural flavours are enhanced. • The taste of foods change; they become less bitter or acid. Spectrographic reading of the treated item will show a change in the molecular structure. • The pyramid will dehydrate and mummify things, without decay or mold growing. • There is also a slowing or complete stopping of the growth of microorganisms. • Kirlian photographs show the aura to be significantly brighter after a 15 minute exposure period. • Persons living, meditate, work or sleep inside of a pyramid building or under a pyramid framework, generally feel immediate positive reactions. Creatures are magnetically attracted to Pyramid replicas. • Testimonials from several sources, demonstrate that pets of all kinds thrive under, or within open frame pyramids. Dogs and cats are observed to respond to the pyramids. Negative Ions help to reproduce and repair body cells. They're transmitted into the body through the air and are circulated by the blood. Too many positive ions (the result of air pollution) can cause depression, and ultimately, illnesses. Thus, negative ions have a beneficial effect on the body. Pyramids generate negative ions. In addition, they are believed to have a generally balancing effect on the body's electromagnetic field. This effect is greatly enhanced if the materials used, is gold or copper. 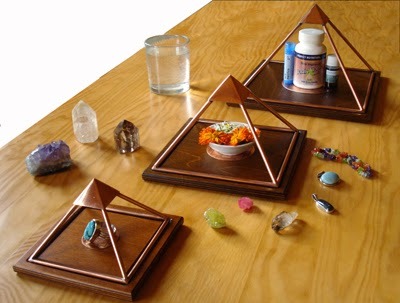 • Charging Crystals is a popular use with pyramids. Quartz crystals are most effective for that, as they hold the charge for several weeks. These crystals can then be used for healing purpose as they release their charge into the surrounding. • Large pyramids (the kind you sit inside) are often used for meditation, massage, acupuncture, and Reiki. • Many people have also experienced that after sleeping inside a pyramid they find that they need less sleep and feel more relaxed and at peace when they wake up. • Many people put their drinking water in pyramids to charge it with the pyramid's negative ions. • It is recommended to put a glass inside a pyramid for about half-an-hour, and large quantities overnight. • The pyramid activates the energies of the pineal and pituitary glands Users experience balance, relaxation, tranquillity, well-being, and in some instances, the reduction of headaches. The pyramid has been known from ancient times as a powerful design that connects to energy forces and its shape is identified with healing qualities. The Egyptians viewed the pyramid as a spiritual symbol because its form directs the electromagnetic energy surrounding the earth and form the stars and other planets. 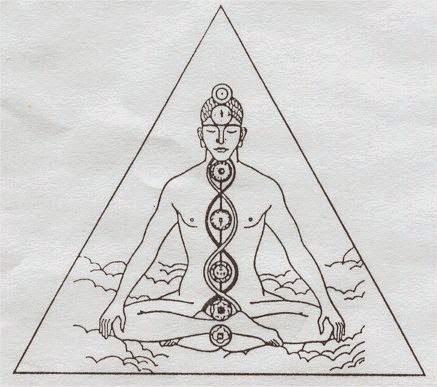 In metaphysical studies, its structure with four sloping sides emits positive energy that neutralizes negative energy .One of its main function is to remove or recycle stagnated and negative energy and focus harmonizing energies. Research and experiments have shown that pyramid powers change the mental, physical and emotional states of individuals who have been exposed to its vibrations. 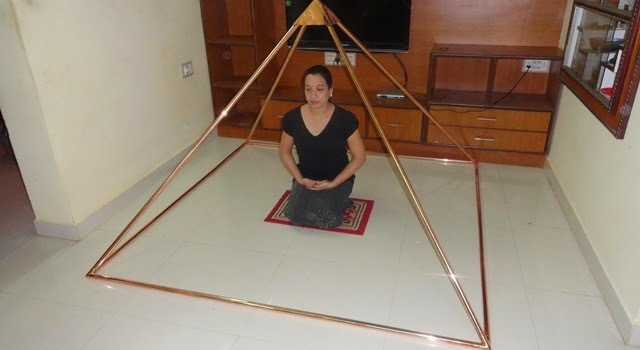 Pyramid Vastu is a practical art to harmonize-mind, body and spirit with the environment, by just placing pre-programmed “Pyramid” at appropriate locations: to achieve health, happiness and prosperity. Pyramid is a powerful science of creating balance and harmony by core level corrections, with the help of pre-programmed Pyramid. It is based on the essential principles of subtle anatomy and law of the universe. Here you are utilizing your own hidden capabilities to achieve a better tomorrow. It is ideal for correcting vastu or feng shui defects without physical alteration, shifting or breaking home or work place. It deals with the roots or vital force, behind all action within it. It is totally innovative concept of subtle level correction with pyramids based on mind over matter. It deals with our inbuilt power and ability of Mind-Body-Emotion. This powerful intention at the core level induces energy within us. Working on principle of bio resonance on a subtle energy level (similar to homeopathy), when taken either internally or externally, pyramid water harmonizes (regulates) all the processes in our organism. And the effect begins exactly in the location where it is needed the most. Such water is extremely rich with oxygen and negatively charged ions, which makes it easy to assimilate. This in turn increases water concentration levels in cells and the overall water level in the organism. 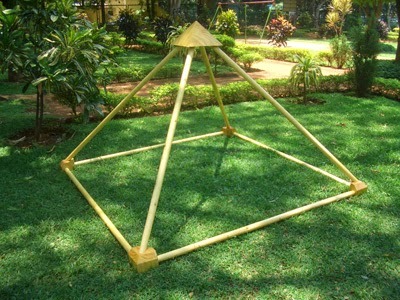 In recent years, Pyramidology has experienced renaissance in fame. Meditation done inside a pyramid, or underneath a pyramid, is called as Pyramid Meditation. The pyramid shape itself is being seen as a supernatural source of power or energy of the Universe. The use of a pyramid in meditation can give rise to feelings of calmness, well being and a more open and a positive attitude. The best results are achieved by sitting in a North facing direction. For better health, one must sit facing the East. If the Meditation is being done for having wealth in future, he/she must sit North-East facing direction. It is better to do healing by Reiki, Crystal Therapy, Angel Therapy, Candle Therapy, etc. The idea that a simple geometric shape or drawing could generate an energy field seems absurd at first glance. Well it works, it really does. It's truly amazing and there is no side effect of using this. Since ancient times, crystals have demonstrated enormous powers and resonated at a high frequency that can generate unimaginable power to the planet. The Atlanta’s were the original discoverers of the powers of quartz crystal. They understood the unique electrical properties of quartz and were able to harness these natural oscillations in ways that we are only beginning to understand today. These crystals were not only used for healing but were also used to store information and energy. They were used to send the human voice and images over long distances just like modern day television. Atlantis was a highly technologically developed civilization that came to a sudden cataclysmic end 40,000 years ago, due to the misuse of these powerful crystals. Everything in the universe vibrates and oscillates. Therefore the connecting link between all forms of energy is vibration, sympathetic harmony and resonance. By studying and applying the principles of quantum physics and esoteric science, the science of crystals can make a powerful impact on future societies and technologies. Crystal pyramids have enormous power and possess healing properties and enhance meditation for raising your personal vibration. Pyramids amplify and then tightly focus energy through the apex. A crystal pyramid can be used to draw off negative energy and blockages from the Chakras. A gemstone pyramid is also used to enhance and focus the inherent properties of the stone. Every stone or crystal has different properties which give the different results but when they use in form of pyramid then the power of the stone increases which in-turns get the more than double benefits. A metallic pyramid harnesses the electromagnetic field of the earth, and tends to concentrate its energies onto the surface of the pyramid, where the metal is. These pyramids should be aligned to magnetic North to have the greatest effect. 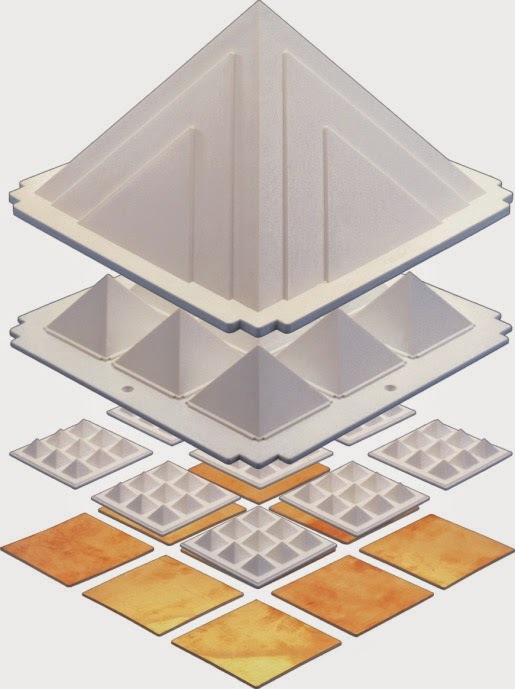 Non-metallic pyramids, being composed of non-conductive materials like wood and stone, consist of the majority of the pyramids around the earth: from the Great One in Giza, to the ones in China and Turkey, to those that exist in North and South America. These pyramids are said to harness the rotational inertia of the Earth, and because of this, they should be aligned to True North. Non-metallic pyramids tend to concentrate their energies into the center of the pyramid, and thus the reason for its name "Pyr-a-mid," or "Fire-in-the-Middle." In non-metallic pyramids, like the Great Pyramid, the greatest concentration of energy is located at what is called the King's Chamber. This is also the geometric center of the pyramid, located at one-third up its height from its base. Pyramids act as an amplifier of one's thought energy, thus if you are focusing on a thought or an idea that you want to manifest into your life, it will amplify that thought accordingly. (Thus, be mindful of your thoughts, as your thoughts do make a difference, especially inside a pyramid!) Also, if one is trying to clear one's thoughts, as is done in many forms of meditation, the intent of that thought is amplified, and one can go into a deeper state of focus and peace much more quickly and easily. Pyramids comes in many forms such as metal, non metal which includes wooden, crystals, plastics, paper etc.